Come on an exciting journey through the rugged mountains of northern Idaho and northwestern Montana! BNSF's Kootenai River Subdivision is a busy section of the Northern Transcon running between Sandpoint Junction and Whitefish. High priority Z trains race between Chicago and the west coast. Stack trains, grain, coal, oil, and mixed merchandise trains run back and forth across the beautiful countryside. This seldom visited line connects two well known railfan hot spots: The Funnel and Marias Pass. It follows the very scenic Kootenai River through the densely forested Cabinet Mountains, allowing trains to sprint along the water level course. Then it's a steady 1% climb through the Salish Range where the thunder of hard-working diesels echoes through the mountains. The top of the grade is marked by the seven mile long Flathead Tunnel, the second longest in the United States. Modern diesel locomotives are everywhere including GE ES44C4's, GEOVS, Dash 9's, EMD SD70ACe's, SD70MAC's, even SD90/43AC's make an appearance on Union Pacific's nearby Spokane Sub. 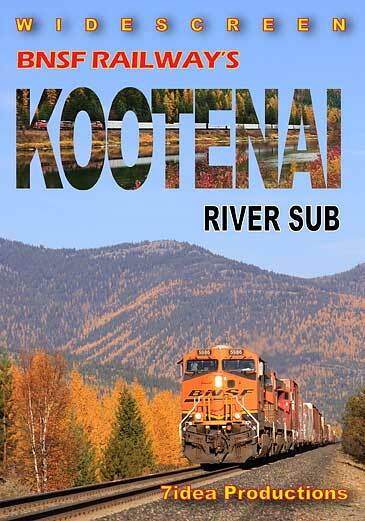 Great railroading action and fantastic scenery abound in BNSF Railway's Kootenai River Sub! Shot in stunning hi-definition in the winter, summer and fall of 2013.
run8anderson (Basking Ridge, NJ) on 2014-06-18 10:57:31. 7idea is second to none. How can anyone NOT give this 5 stars. Aaron puts out another superb product!! mySP7377 (San Diego Ca.) on 2014-06-17 00:41:22. Simply put "Fantastic" Aaron and 7Idea does it again with another awesome DVD. The photography, narration, maps and graphics are everything you've come to expect and see from 7 Idea Productions. 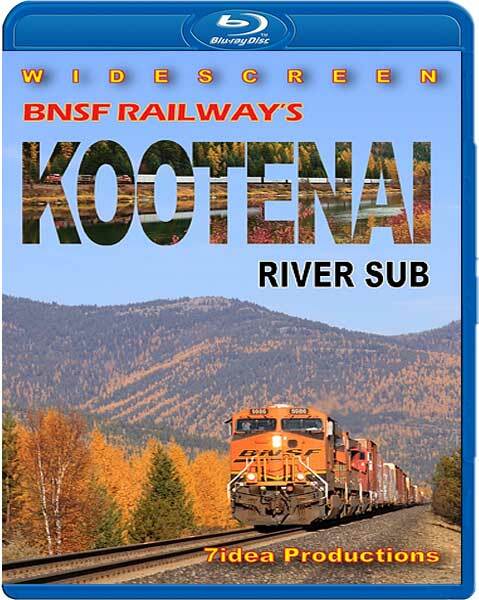 Great coverage from an area that doesn't get much attention but offers fantastic scenery and lots of train action, after watching this DVD I was ready to grab my camera and overnight bag and make a run to see this district for myself. A steal at this price grab a copy while you can you wont regret it. Dave Feath (Harrisburg PA) on 2014-06-05 15:40:25. Aaron, you've done it again. Taken an unknown piece of railroad, and made it so interesting you want to watch the DVD over and over (and I have). Showing the parallel Union Pacific to Eastport was brilliant; I don't know of anyone else that would do that. Lot of views from high places and plenty of shots of the beautiful mountains. Another great video from 7idea productions. I can hardly for your next production. In the meantime, I'll keep watching this. Hueycrewman (Dulcca, Qld, Australia) on 2014-05-29 15:30:41. An area of the USA that we rarely see in such glorious full colour, with trains a plenty filmed in another wonderful 7Idea Production. You have to see this in Bluray to actually be there. Michael Tolich (New Zealand) on 2014-04-27 15:14:43. This is an excellent production just like you would expect from 7idea. The scenery is stunning and there is plenty of rail action to keep you interested. I admire the production team for taking the time to trek to areas we might not take the time to do ourselves. Not a lot of "guardrail" photography in this DVD. KSmith6350 (Oakland CA) on 2014-03-19 21:22:22. This is another outstanding video from what I would say are probably the best railroad videographer's around. They give a very good description of the area and trains that are traveling thru. This is an area that is not seen by rail fans very often and I am glad that 7idea was able to give us a detailed look at this beautiful spot on the BNSF Kootenai River Sub. I will give it 5 Stars.